I love having my kids home for the summer. Not much of a schedule, lazy afternoons and lots of time together. That being said, it does get a little complicated with my painting schedule. With as busy as I have been in that regard, finding balance is hard. It is my responsibility to make sure my kids have a great summer and it is also my responsibility to help out financially at the moment. Figuring out how to do both well leaves me a little rundown sometimes. I have a great group of friends that used to get together regularly, but as our families grow, there is less time to get out and enjoy girls time. We recently decided to get together and head out to dinner at Applebees. It was much needed and so good for all of us to check out and enjoy some time catching up and eating yummy food. (Applebees has the most delicious Chicken Caesar Salad!) The atmosphere there is casual and relaxing and we ended up chatting and eating for over two hours! Our server was great and didn't try to shove us along so she could reseat our table. That is always nice. I usually feel a wee bit guilty getting out and enjoying time with friends, but I always come home so glad I did because I'm rejuvenated and ready to be better in all my areas in my life. If you don't follow Applebees already, they are on Youtube, Twitter, Pinterest and Tumblr. They are encouraging us females to get out and enjoy some much needed time socializing with friends. Many of us do not make as much time for that as we need to and Applebees is working to get us out to enjoy some great company and good food. They are hosting a giveaway to allow you to do just that. Could you use a girls night out too? Leave a note in the comments section telling me why and be entered to win in a $150 Applebees giveaway! This sweepstakes runs from 7/9/12 – 8/3/12. Be sure to visit the Applebee's Life Is Better Shared page on BlogHer.com where you can read other bloggersí reviews and find more chances to win! Yes! My pregnant friends are all saving for babies, so it'd be great to treat them to a night out! I could totally use a girl's night. My husband just retuned from a 12 month deployment and after having a 3 year old and 2 year old 24/7/365 with NO break... I would love a night out!! I could really use a ight out! I have been assisting with the financial and physical care of my elderly father for the past two years. My father is a left leg amputee and is also blind due to complications from diabetes. I also work fulltime and have to maintain my household duties and make time for my husband. While I would make the same choice again if faced with this situation, having a break from providing meals would be awesome! I was going to tell you why I need a night out - I may have to give my winnings to LisaB, who is caring for her father. After reading above comments mine is unworthy to write. They all deserve it - what do you say Applebee's? I haven't had one in years and could really use one. Thank you for the chance! What a fun give away! I would love to win a Girls night! :) I think I should win the giveaway because it would change my life. I would consume mega calories while deepening my relationship with my besties! I would instantly be smarter, more fashionable, fit into my skinny jeans and my subtle wrinkles would vanish! I can not remember the last time that I had a girl's night out. It has to be before some of the ladies had children who are now 7 and that such age. i haven't seen my gal pals in a while and would appreciate a chance for a night out. it would be great to see them and catch up. My GF nd I are so far apart these days, winning this would be a great step towards geting that reunion together! Thanks for the chance to win. Your pic is great, you gals look like you had a great time.. What a pretty bunch of ladies! 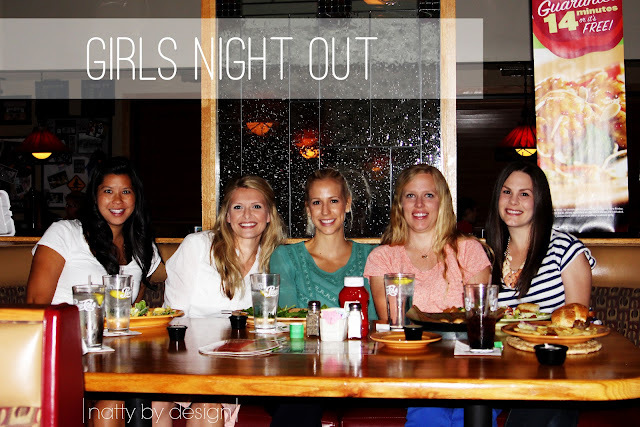 I agree with you - a girl's night out is so rejuvenating! It's difficult to make the time for it, but it's always worth it. I would love a night out with my friends. I have four little ones. Motherhood is great, but it's also hard! And I love Applebees; they have some of the best appetizers ever! i could use one i had a baby in Jan and i been so busy! Would be nice to get out. What girl doesn't need a girls night out. Especially with it being summer. I haven't had a girls night in over 4 years and I could really use one with my college girlfriends! It would be great to have a girls night out especially since I've been squandering of late because I'm my lack of income at the moment. This is exactly what a girl needs good times, foods and drinks! I could really use this. I can't even remember the last time I had a girls night. No time or money. Goodness, gracious! I need a GNO because I've been babysitting my niece all week, which makes five kids for us (feels like a million). I need to get outta the chaos for a night. I love Applebee's! This girl could use a girl's night out! I have 2 young boys, pregnant with my 3rd, and my hubby is deployed to Afghanistan! I love Applebee's! I am a SAHM to my three-year old son and my five-year old daughter who has special needs. Being a one income family money is tight, so I feel guilty for spending money on myself if I go out with my girlfriends. This would allow me and a few other SAHM an opportunity to go eat, drink, and be merry without the mommy guilt!! I could use a girl's night out because I am home with my children all the time and I could use some adult conversation and good food & drinks. Just had a great girls night out at Applebees myself! Would love to win and do it again! I'd like to treat my girlfriends from high school whom I've just started to see again decades later. I'm a single mom to two boys - so I could ALWAYS use some time away with the girlfriends! Our monthly girls' dinners have gone by the wayside as babies have taken over our worlds. Makes me a little sad, but I try to enjoy the rare opportunities when they do come up. I could use a girl's night out! I never do it, but it sounds like a lot of fun. My cousins both have babies (one of them has twins) and I'm sure they would enjoy it, too. i could use a girl's night out because i havent seen my friends for a long time since i had a baby. i really miss them and this would be nice. it has been so long since I had night out. ineed this. I could definitely use a girls night out! I haven't had one in a couple of years! Lifes stresses have been a lot & this would be a great stress reliever! I work 43 hours a week, I'm a wife, a mother of two grown boys, a grandmother a sister and a daughter. My time away from work and home is NEVER!! WE all have small children and could use the adult conversation. I could use a girls night out because I just turned 30 this month, I have three girls that I stay home with (a 5 year old and 3 year old twins) and I rarely get a night off. My house is also currently on the market which leaves me in a constant state of stress and cleaning. Oh how lovely a girls night out for some drinks at Applebees would be! The last time I had one was last June (2011) with my sister! Thanks for a chance to win and have a great day! I could use a girl's night out because it has been a year since I've gotten some real in person time with my girls! How has that even happened, right? I guess life has just been super hectic. a girls night out is always lots of fun! Between work and home chores, a girl's night out is very much appreciated and needed. I really need a girls night to just talk to other adults! Surprising how you forget to interact with adults when you are with kids all day! Because with a full time job, I could use some time with the girls! Yes, I could use a girl's night out to de-stress from work and mom duties. My kids are two and one...need I say more?!?! HEHEHEHE! i could use a girls night out because i havent had one in years since motherhood began... Thanks for a super giveaway! I cannot remember my last night out with friends...maybe 3 or 4 years ago? It's been far too long! It's nice to have a girl's night out after a long day at work. We had one last friday and it was great. Thanks for the review and giveaway. Seems like even with all the technology and communication possibilities that my friends and I are even farther apart than before all the easy connections. I'd love some real face time because everyone puts on the "life is great" side on Facebook and such but face to face you find out what's really going on with a friend! Last time I went to a girl's night out, it was about a year ago and we went to P.F. Changs. It has definitely been a while! Last time we had girls' night out was about a year ago. We talked late into the night after our dinner at a Mexican diner. I could use a girls night out (or afternoon since we're all seniors LOL) I miss my friends. Wow I could really use a girl's night out! I've become my mom's unpaid caregiver, so money has been too tight to go out with friends. It's been over 5 years since I had a night out with my girlfriends! I definitely need a night out with my girls! Seems like all I do is work & go to school. I couldn't even tell you the last time I had a Girls Night Out, but next weekend at BlogHer, that's what I'll be doing all weekend! I could use one because I haven't had one in sooo long! I need a girls night out because I haven't had one in like ten years. It's been almost a year since I've had GNO and with 3 kids at home for the summer, I need one. Oh I could use a gals night out for sure! It's been way too long! What a fun giveaway!!! yes please! a night out is just what i need!! Summer is so hard to get together with the girls. And summer is when we could use a break from the kids! A night out would be great! I had a girls night out two weeks ago, we went out for dinner and drinks. I need a girl's night out because we always laugh. That laughter revitalizes me and makes some problems easier to handle it seems, the next day. I don't really do the girls' night out thing. Never have really been into that since getting married. I prefer to hang with my hubby honestly because he is my best friend. Now the two of us could sure use a night out! Just tired of always eating at home or eating cheap...would be nice to splurge with this GC! Money is TIGHT! I haven't had a real girls' night out in a long time. Going camping with my friends and all the kids in a week. We enjoy late night around the campfire after the kids go to bed. Only problem is we are still responsible for all the cooking. I could sure use one! The last time was WELL over a year ago! OH wow! Last girls night out for me was about 10 years ago before I had my first back surgery. I dont get out often anymore, but it sure is needed! I could use a girl's night out because it seems like our schedules just never mesh to give us the opportunity to get together. It's been several years since we had a real girl's night out. I’m a working mom, so I cherish the time I get away from home with the girls…..often we just stay in at someone’s house, but I think it would be great to be able to go out and have other people prepare and clean for once!! !It's been a while since our last time, and we are due! What's up Dear, are you truly visiting this website regularly, if so afterward you will without doubt get fastidious experience. clear your thoughts prior to writing. I've had a tough time clearing my thoughts in getting my ideas out. I truly do enjoy writing however it just seems like the first 10 to 15 minutes tend to be lost just trying to figure out how to begin. Any recommendations or hints? Cheers! What's up friends, good paragraph and pleasant arguments commented here, I am in fact enjoying by these. I've learn a few just right stuff here. Definitely value bookmarking for revisiting. I surprise how so much effort you set to make the sort of fantastic informative site. I don't even know how I finished up here, but I thought this put up used to be good. I do not recognise who you might be but definitely you're going to a well-known blogger in case you are not already.